Skeleton of 6 ft 7 inch Chieftain, 1,000 BC Kazakhstan. At six feet, eight inches, he would have towered over his contemporaries. 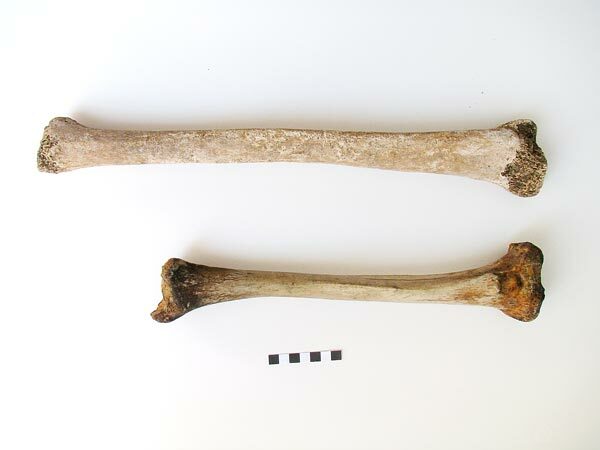 The giant’s tibia, or shinbone, compared with that of a normal Roman male of the same period. It’s no tall tale—the first complete ancient skeleton of a person with gigantism has been discovered near Rome, a new study says. At 6 feet, 8 inches (202 centimeters) tall, the man would have been a giant in third-century A.D. Rome, where men averaged about 5 and a half feet (167 centimeters) tall. By contrast, today’s tallest man measures 8 feet, 3 inches (251 centimeters). Finding such skeletons is rare, because gigantism itself is extremely rare, today affecting about three people in a million worldwide. The condition begins in childhood, when a malfunctioning pituitary gland causes abnormally growth. Two partial skeletons, one from Poland and another from Egypt, have previously been identified as “probable” cases of gigantism, but the Roman specimen is the first clear case from the ancient past, study leader Simona Minozzi, a paleopathologist at Italy’s University of Pisa, said by email. The unusual skeleton was found in 1991 during an excavation at a necropolis in Fidenae (map), a territory indirectly managed by Rome. At the time, the Archaeological Superintendence of Rome, which led the project, noted that the man’s tomb was abnormally long. It was only during a later anthropological examination, though, that the bones too were found to be unusual. Shortly thereafter, they were sent to Minozzi’s group for further analysis. To find out if the skeleton had gigantism, the team examined the bones and found evidence of skull damage consistent with a pituitary tumor, which disrupts the pituitary gland, causing it to overproduce human growth hormone. Other findings—such as disproportionately long limbs and evidence that the bones were still growing even in early adulthood—support the gigantism diagnosis, according to the study, published October 2 in the Journal of Clinical Endocrinology and Metabolism. A Giant of the Stage? Charlotte Roberts, a bioarchaeologist at the U.K.’s Durham University, said she’s “certainly convinced with the diagnosis” of gigantism. But she’d like to know more. “You can’t just study the disease, you have to look at the wider impact of how people functioned in society, and whether they were treated any differently,” Roberts said. Goods buried with a body, for example, can offer hints to the person’s role in life and how they were treated in their community. The Roman giant, though, was found with no funerary artifacts, study leader Minozzi said. And, she added, his burial was typical of the time, suggesting he was included as part of society. Whatever the Roman giant’s lot in life, the information to be gleaned after his death might someday further science. A Kazakh archaeological expedition has found a burial place aged about three thousand years during excavation of a burial mound near Lisakovsk town in Kostanay oblast in Kazakhstan, Tengrinews.kzreports.Three Bronze Age stone vaults were found by the archaeologists. The experts were amazed by the two-meter man skeleton that was found in one of the vaults. The archaeologists said that the remains must have belonged to a tribe chieftain.“This is a unique founding in terms of society differentiation. This will help us to understand what was the attitude to a person was vested with a “chieftain” authority. The other two vaults had been robbed. They were women burials. It was permitted to enter them and to take different adornments from them. Everything could be taken from there, but it was forbidden to enter the chieftain’s tomb,” Emma Usmanova, the archaeological expedition head said.Pottery and food were neatly set next to the chieftain’s skeleton. “It won’t be possible to restore his hairdo, but the main appearance could be restored. It is obvious that the man had strong muscles. Places of attachment of muscular tissue are well pronounced on the skeleton, and there are big rough mamelons on his bones. This means that the man’s physical build was very strong”, Aleksey Ovsyannikov, the participant of the expedition and the head of Karaganda oblast forensic division said.As soon as it stops raining, the archaeological expedition will continue the excavation at the burial place. This entry was posted in Uncategorized and tagged cromagnon giants, giant skeletons, giants, nephilim. Bookmark the permalink.